Weeks ago I was wasting time on twitter when Canada’s own Karl Schroeder began a series of tweets about non-violent resistance and Suzanne Collins’ YA novel The Hunger Games. I’ve reproduced his ideas below so that we can all get on the same page. Though I’ve yet to see The Hunger Games screen adaptation, I was captivated by Schroeder’s ideas. At no point during my own critical interaction with the text did I ever stop to think about non-violent resistance on the part of the tributes or the people of Panem’s districts. For the sake of this post, I thought I would work through the first question that I came up with upon thinking about Mr. Schroeder’s words. What would happen if a tribute said no? Let us assume that our would-be tribute has found the remains of some pre-cataclysm library, and is therefore intellectually and spiritually prepared to reject any role in the institution of the Hunger Games. When Reaping day comes, their name gets called. Yet our tribute is nowhere to be found. As a show of protest they decide to sleep through Reaping day. I imagine the state’s response would be two-fold. First the Peacekeepers would track down the offending tribute. Then I expect the Capitol’s representative would begin a systematic shaming against the family of our tribute; after all it is an honour to be selected for the Games. Assuming the limited free-market economy that exists within district twelve, as seen in the novel, is endemic of all of Panem, exclusion from society could be a powerful weapon of social control. However, shame is a tricky thing. It assumes that the people instigating the shame can appeal to shared values with those evoking the shame. Despite the fact that some critics like to draw comparisons between Collins and Orwell, Panem is not Oceania. It’s not even Rome. The people who live in the districts are not subject to systematic thought control/modification. The Capitol primarily holds its power through the apathy of the districts and its military might. In fact, if we trust Rue’s description of district eleven and Katniss’ vision of district twelve as accurate, then the vast majority of the people who live in Panem’s districts actively dislike the Capitol and President Snow, including the Peacekeepers who deal in Katniss’ black market goods. Ergo, attempts at state sanctioned shaming might have the opposite effect whereby they generate a sense of community within a district. Things get less optimistic once the tribute is relocated to the Capitol. At that point non-violent resistance must take one of two forms, suicide or willing slaughter in the arena. An interesting question then emerges: is it still an act of non-violent resistance if a tribute steals a knife from the dining room of their quarters and cuts open their wrists in the bathroom? If death is inevitable, how much value do we put on the agency of that death? Is a conscious decision to self-terminate equal to allowing oneself to be killed? If the Medium is the Message, make sure to control the Medium. Remember that those in power within the Capitol are experts at manipulating the media. The message of non-violent resistance, the essential refusal to be a party to blood sports and its associated social structures, would never make it out into the districts. Be it a bedroom suicide or a tribute stepping into the active mines surrounding their entry point into the arena, the facts would get edited, spun, and managed into oblivion. This begs the question, if there’s no audience for non-violent resistance, does it still have a purpose? From a critical and moral point of view, I can completely see what Schroeder means about not letting the discussion happen within the book. Yet questions of non-violent resistance within the world of The Hunger Games would likely turn into a discussion that rationalizes suicide. Personally, I think that would be interesting. But I wonder how many publishers would want to add that particular layer to a book that already pushes boundaries of acceptable taste in framing state sanctioned teenage death matches within the lens of faux-Orwellian dystopia. To put it another way: how would the public respond to a young adult novel that legitimized suicide as a form of political dissidence? If you thought the Harry Potter controversies were bad, imagine Collins’ novel being framed within the context of self-immolating Buddhist monks. As you’ve said, judicious editing would prevent it from getting out or at best it would be a rumor. From what I saw, each district was kept isolated and patrolled so that there isn’t enough cross-communication present so that a non-violence movement could take off. 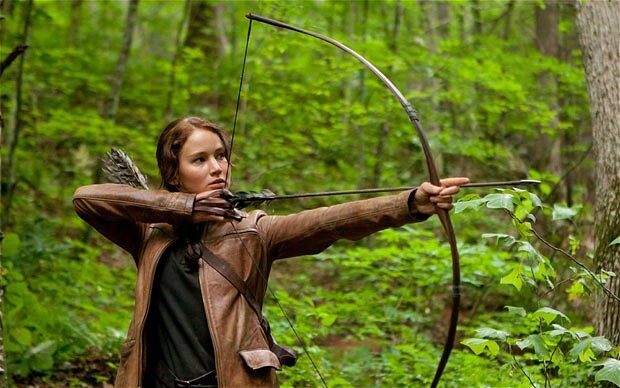 One person being non-violent in the Hunger Games is suicide. A significant portion of the tributes being non-violent could cause change. Another way to look at it though, is that it is ultimately non-violence that does succeed. The ending of the movie has Peeta and Katniss both about to eat poisoned berries as opposed to one killing the other in order to win. They decide the best way to win is to not play and both end up winning. This isn’t a “pure” non-violent protest from my perspective, as both had participated in acts of violence prior to this, but it does have echoes of some non-violent solutions. Indeed, I see what you’re saying. A non-violence movement might have the potential to gain some traction within an individual district, but I don’t think it could ever really spread either. Even if a passive/non-violent resistance movement sprang up, it would be easy enough for the Capitol to turn the ringleaders into avoxes, or in the event of a large ideological outbreak, nuke the entire district like what they did to district 13. Not sure if that made it into the novel, but that’s the entire reason why the Hunger Games exist. The original 13 districts of Panem rose up against the Capitol, lost a war, and as punishment the Hunger Games were created as a way of reminding the remaining 12 districts about the futility of resisting. I wonder though, how much would the novels have been enriched if even the idea of non-violent resistance was put on the table but subsequently rejected. Would it have an anti-heroic effect on Katniss and Peeta if they considered the idea of refusing to be tributes but then ultimately decided that they would kill to survive? Actually, the character “Foxface” (her real name is Finch) kills herself by eating berries stolen. She also came in fifth place without killing anyone. She did her own nonviolent protest but the Capital made it look like she accidentally poisoned herself.